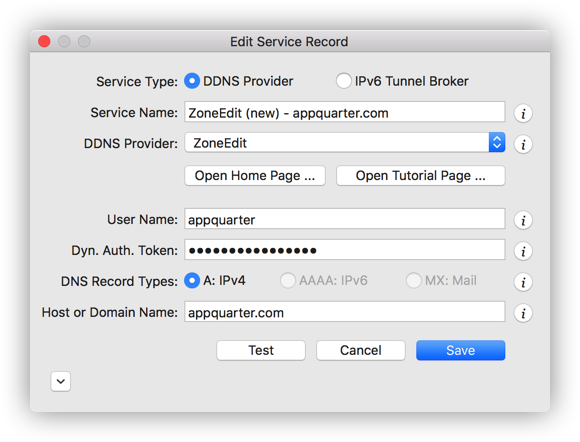 As of January 1, 2017 there are two dynamic DNS provider profiles for ZoneEdit: "ZoneEdit", and "ZoneEdit.com". While we are continuing to support the legacy profile "ZoneEdit.com" as is, we are also adding a new profile "ZoneEdit". The sections below shows how to create a service record for both provider profiles. The screen shot above depicts a service record example for ZoneEdit. Most of the fields in this dialog are self explanatory, but some fields require brief explanations. Login at ZoneEdit.com using your credentials.